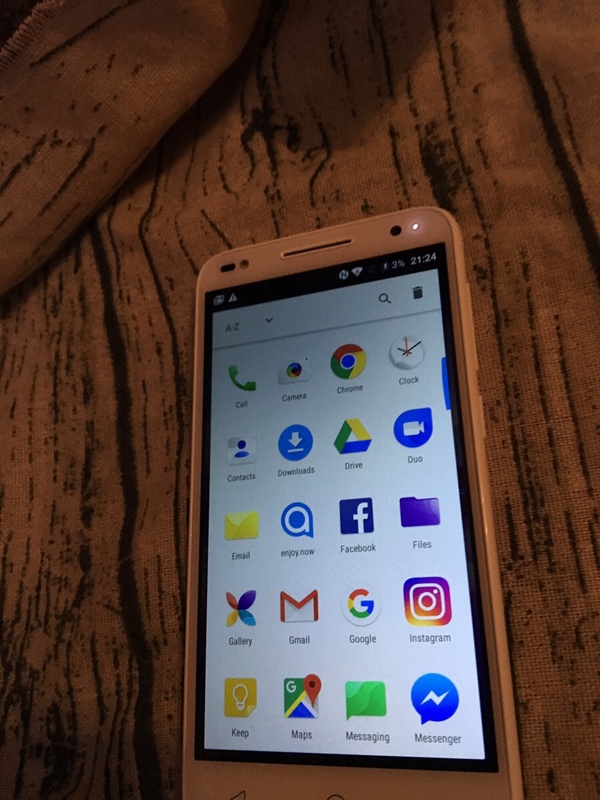 We were recently sent a brand new android phone to test out. 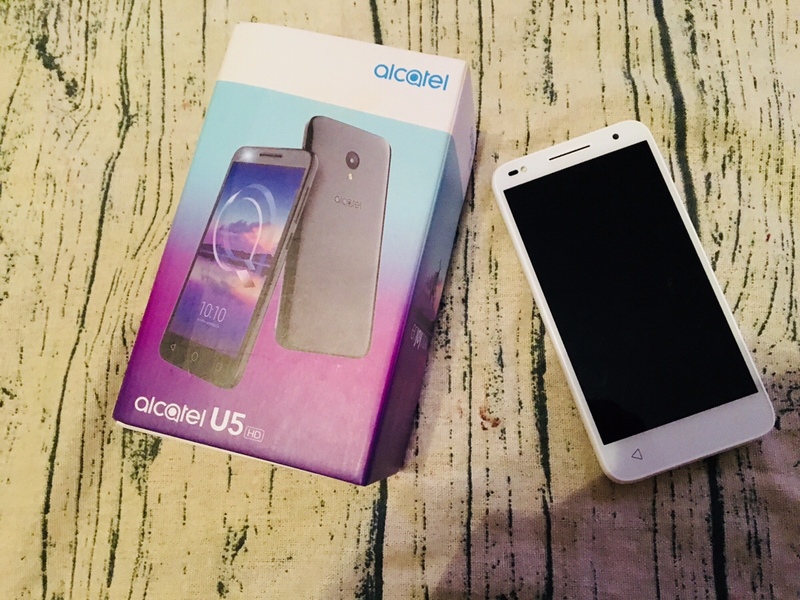 The phone is an Alcatel U5 model. I do love my iPhone and would not dream of swapping it, so this phone was eventually given to my daughter Jordanna who has been in need of a new one. The phone takes a micro SIM card and has a fairly large 5″ screen. This is the perfect size for youngsters who may spend lots of time using the phone. It comes installed with the Android 7.0 (nougat) platform and as with most standard android phones, there is 8GB of phone storage. This is usually not enough storage for the majority of phone users, but there is also space for a micro sd card to increase the storage. The main camera is 13mp and takes a pretty good photograph. The front camera (for selfies) is 8MP. Camera features include a range of filters, flash, zoom, timer, face recognition and it takes videos too. There are a selection of apps pre loaded onto the phone. These include Facebook, gmail, chrome, browser and general standard apps such as clock, gallery, files, messaging, maps and a few more. Extra apps and games can of course be downloaded from google App Store where there are literally thousands of them, both free and paid for. Unlike IOS you don’t need to input payment details, it will ask for them at first but just press skip when downloading free apps. If giving the phone to a child then I certainly recommend NOT inputting any payment details whatsoever. Kids have a knack of downloading anything and everything paid or not and all those game add ons and extra tokens could leave your bank account very much in the red. 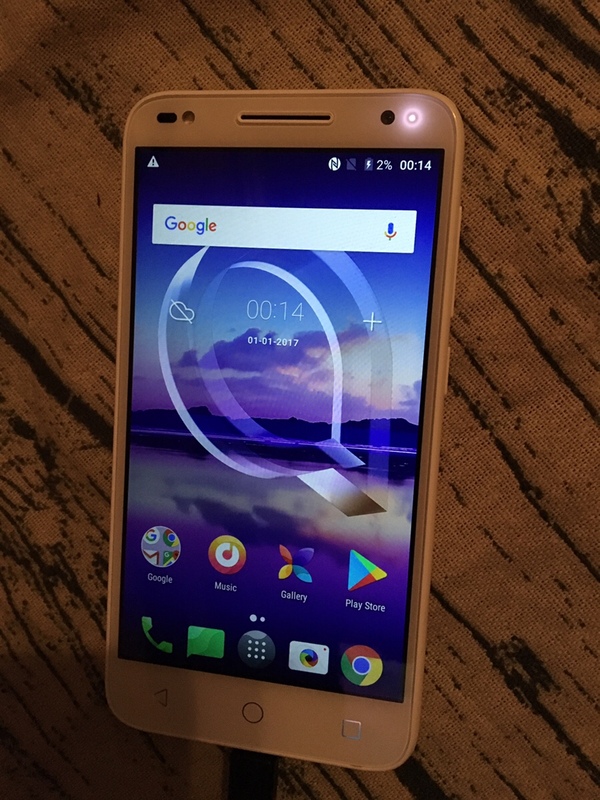 You can view the full specs of this phone over on the Alcatel website. When the new phone arrived it had zero charge. I mean zero. I actually thought the phone had a fault as nothing was happening when I plugged it in. The phone comes with very minimal instructions but it’s very similar to other android models. Two buttons on the side, one for power and one for volume. I left the phone on charge and after ten minutes or so it finally gained some life. It started vibrating and on came the battery icon as above. I think the phone needs to have at least 3% or so before it will power up. 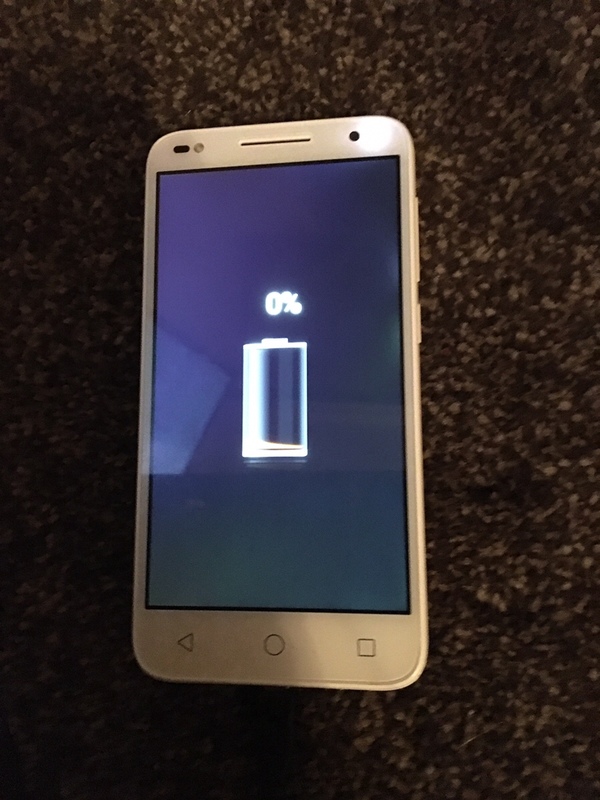 Powering up involves a welcome screen and takes about 20 seconds to power to the android screen (lots of images and welcome notes before this) it can be played about with whilst charging but this then hinders the fairly long full charge time of 4 hours (its best to charge overnight first time). You’ll need a google account to register for App Store and general phone settings but if you don’t have one, you can sign up for one via the phone. Input your wifi settings at the start and the phone is ready to go. It even works fine without a SIM card tho obviously you can’t make calls until you log one in. Yes it’s also network free meaning any Sim should work. I found the display very clear, nice and bright which can of course be adjusted and just so easy to use even without any instructions, but I am used to technology and android. The vast amount of apps may confuse the slightly older generation. The phone comes with a pre installed themes app which contains many beautiful phone themes and wallpapers ready to easily download and the majority of them are free too. It’s the first time I’ve seen this on android but it’s a great thing to make the phone your own. The screen responsiveness is very fast, maybe a little too fast but it certainly beats any previous experience of android devices which can be rather slow at responding. This may change however with the more apps, games and photos that take up the phone space. We have so far found very few problems with the phone. The main problem being the long charge time and when the phone is completely dead it can take a while before the battery symbol even comes on. The tiny nano sims can also be a pain to insert as they are so small and fiddly but this problem is not just limited to this phone model. Perhaps sim manufacturers could invent some sort of device to insert sims and memory cards a little easier since they keep making them smaller and smaller. The phone is available in both black and white. It comes with a wall charger, usb charge cable and ear plugs. It can be purchased from many shops and stores that sell phones both on pay as you go and contract. Prices for pay as you go vary from £70 – £100 approx. It’s a great android phone, easy to set up and use, very responsive, good clear sound when talking and for music etc. Option to increase phone storage via sd card slot, network free, clear display, excellent duel camera and an all round perfect phone for most ages. I’d give this phone an 8 out of 10 for performance and value for money. The slow charging slightly lets it down. The battery can also drain quickly depending on what’s being used on the phone. I would advise installing a free background app checker/killer and a battery monitoring app.